Eight fishermen from Kollam travelled to Pathanamthitta when they heard how dire the situation was, and have already rescued 40 people so far. They have already rescued 40 people, and are more than ready to rescue more when called upon. The 8 fishermen from Moothakara, from Kollam, rushed to Pathanamthitta on two boats as soon as they heard how dire the situation was there. Their journey from Kollam to Pathanamthitta itself was filled with hurdles. 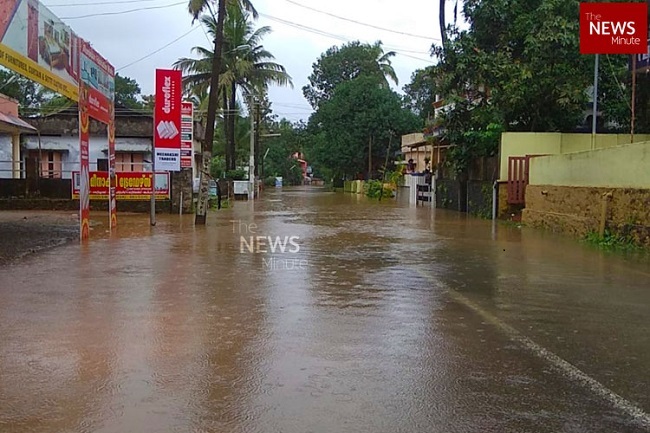 Pathanamthitta is all but cut off, as overflowing rivers and canals have lead to roads being blocked. But nothing could affect their spirit. “We thought of nothing but the people who are isolated from the rest of the world,” Satheesan, one of the fishermen, tells TNM. The team, Charles, Remji, Edwin, Melwin, Printon, Stalin and Raja, were on their way to Kozhencherry, but were requested by locals to stop at Kaipattoor. The bridge connecting Kaipattoor and Kozhencherry was closed as it was inundated, cutting people off. The fishermen loaded their boats on to a lorry, which took them as far as it could, after which they began their relief operations by boat. One of the first people they rescued was a mother and son from Paruman Thirumeni Kurishupally, close to Kaipattoor, where we met them. “We heard the son screaming for help...it was so disturbing, it feels like we can still hear him screaming,” says Satheesan. Cini and her son were stranded on their terrace for a couple of days as their house was under water. “We have already rescued 41 people. We can see the relief on their faces when they spot us. Most of them cooperated with our instructions, which makes our work easier,” says Printon. Those rescued by them were immediately shifted to the relief camp at the St Gregorios School in the area. “Some are reluctant to come with us; they are not yet fully convinced about the gravity of the situation. In fact, we didn’t just see the water levels rising in front of our eyes, we could also feel the currents getting stronger,” says Melwin. The team then went on to Kurishupally, to the families on the shores of River Achankovil, where they saw dozens of people gathered, waiting to be rescued. “We aren’t getting a single rupee as remuneration for what we are doing, but that isn’t why we are doing this. We are saving lives, and we can’t think of anything else that could give us this feeling of satisfaction,” says Stalin. The fishermen hurry off at the end to a home where a family has requested them to find their passports. The family works in the Gulf, and were scheduled to return to work soon. However, they won’t be able to travel without their passports. “We have asked the locals to help us find our way there, we are only doing what we can,” they say, as they set off on their two boats. Note: In case you are looking for someone stranded in Kerala or have information about someone, use this 'Person Finder', which crowdsources information, to help.